Suppose you're a commuter rail operator. Suppose you'd like to run a peak of 9 trains per hour (tph) per direction. Suppose your express trains can run the line in 60 minutes. Suppose your non-express trains can run the line in 70 minutes. Suppose your non-express trains have at least a couple of different stopping patterns. Suppose signals allow a minimum headway of 3 minutes. Construct a working timetable entirely without overtakes. Winner gets the big red suspension bridge I've been unable to sell! The day has finally come! Caltrain is about to certify the environmental clearance documents for the electrification project, achieving a key milestone on the path to "shovel readiness." Note that electrification is different and separate from HSR, although it is closely related and serves as a key enabler of HSR. The present certification has to do with Caltrain's own long-standing plans to convert from diesel power to clean, fast and quiet 25 kV overhead electric power, regardless of HSR. For those who remember, the Draft EIR was published in 2004, and the idea of electrification dates back to the 1980s. The final EIR is posted here. over three-quarters of electrification’s projected costs are expenses that do not depend on the specific track alignment; these include vehicles, power substations, and maintenance yards. Therefore, even if the entire track alignment were relocated as part of building the ultimate four-track, grade-separated railroad, in the worst case only about one-quarter of the total electrification cost for that segment of the route may be wasted. But such waste would be minimized. Design plans or conceptual plans for the ultimate alignment would be used in the detailed planning for electrification to reduce the amount of additional electrification work needed as the ultimate alignment was completed. In addition, virtually all of the OCS equipment (with the exception of the foundations, OCS conductors and any underground duct banks) can be re-used, thereby further reducing any waste and associated costs. Congratulations for passing this important milestone. 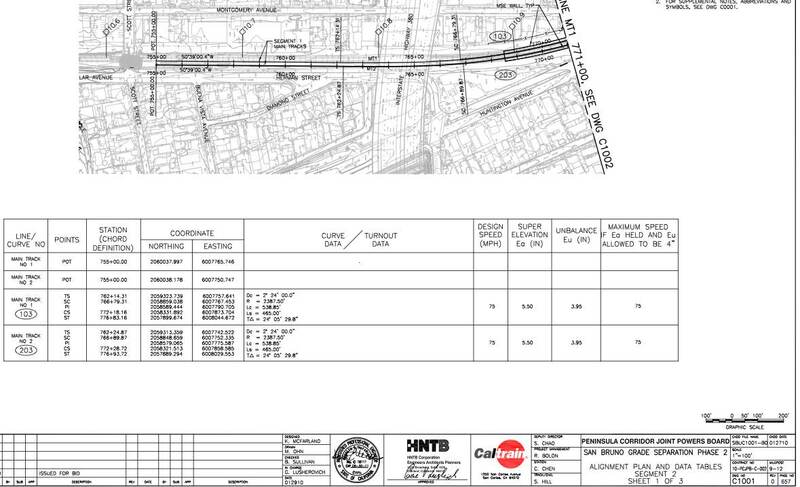 Caltrain's San Bruno grade separation project is out to bid as of March 11th. The final engineering drawings reveal the HSR-hostile curve radius of 2387 feet, good for 75 mph (see details at right). While Caltrain has been exercising eminent domain in preparation for construction, they never seemed interested in acquiring the run-down houses on the inside of the curve to straighten out what is, has been, and will now forever be the #1 worst curve on the peninsula. Caltrain officials continue to spread the falsehood that the curve is HSR-ready and that the design speed is 90 mph. 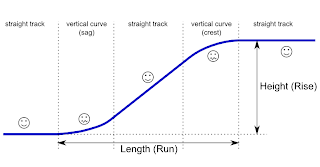 Unfortunately, at an aggressive total cant of 12 inches (6 inches superelevation plus 6 inches unbalance) this curve will forever be restricted to a bit over 80 mph. Total cant would approach a drink-spilling 15 inches to run a train through the inside curve at 90 mph, something the FRA will never allow. HSR trip time penalty: about 25 seconds, or 1/4 percent of the entire SF - LA run. That may not sound like much, but when you consider that trip time is the foundation of high-speed rail, and that the next second saved always costs more than the last second saved, San Bruno is a terrible way to start off on the HSR path. Those 25 forsaken seconds will have to be recovered elsewhere, likely at far greater incremental cost than just doing San Bruno right with a 100 mph curve. Roller coaster rides, and avoiding them on the peninsula rail corridor, is a recurrent concern that recently came up in a discussion of tunnels. 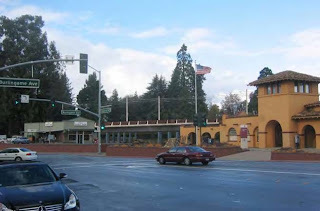 Millbrae councilwoman Gina Papan claimed that an underground station in Millbrae would cinch a tunnel through Burlingame because "you can't have a roller coaster from Millbrae to Burlingame." Let's bust this myth with a quick look at the physics and specifications of HSR track alignment. Discomfort arises when there is a curve in the tracks, because passengers conform to Newton's first law: they tend to keep going straight. The centripetal force imparted by the train causes them to follow the curve, and sometimes to spill their drink. In horizontal curves (left or right), engineers can use superelevation, a simple trick that harnesses gravity to provide the centripetal force and smooth the ride. Vertical curves (up and down) are a different matter: passengers must bear the full brunt of the centripetal force. The centripetal force is perceived as a vertical acceleration, such as you might feel when riding an elevator, and goes as velocity squared divided by radius. What do these mean? To find out, it's helpful to look at a picture of what a vertical track profile looks like when you need to transition from one elevation (or depth) to another. The figure at right shows the basic anatomy of a vertical transition. Passenger discomfort (if any) occurs only in the curved portions at the beginning and end of the transition; the straight ramp in between is not perceived as having any less comfort than flat and straight track. Simply lengthening this ramp will increase the overall height of the transition. Assembling the above specifications into actual ramp lengths, we can calculate a useful metric: the total length of a vertical transition, depending on how much rise is required. Keep in mind that even the "exceptional" values would not be anywhere close to a roller coaster ride: the acceleration would be only about 4% of gravity. 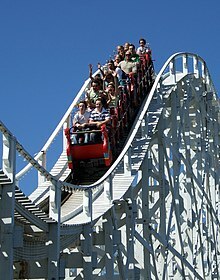 Roller coasters routinely exceed 100% of gravity. What immediately jumps out from the table is that the trickle of peninsula freight trains make these transitions much longer and potentially much more community-disruptive than passenger-only infrastructure. As for Gina Papan's notion of Burlingame getting a tunnel as a consequence of a hypothetical underground Millbrae HSR station: it would take less than a mile for tracks to rise up to an elevated structure that clears Broadway in Burlingame, with the utmost passenger comfort. Burlingame, a city of trees, is increasingly aware of the impending arrival of high-speed rail. The city has taken a strong pro-tunnel stance in its EIR scoping comments, and is a founding member of the Peninsula Cities Consortium. The peninsula rail corridor in Burlingame could be described as mostly Kansas-flat and Mississippi-wide: an abundance of railroad right-of-way with relatively few constraints contrasts sharply with Burlingame's neighbor to the south, San Mateo. 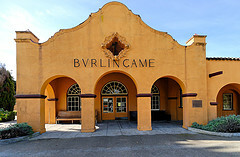 The Burlingame station recently underwent a $20M renovation by Caltrain that converted the narrow center platform to outside platforms, to allow two trains to safely occupy the station area at the same time. The new platforms were opened in early 2008, just in time for the city's centennial celebration. The depot was built in 1894 in the Mission Revival style and is listed on the National Register of Historic Places (photo above by Schaffner). Not surprisingly, it is considered one of the architectural jewels of the city, and visions of what might become of it in the age of HSR differ greatly. In the discussion of visual impacts in the program EIR, the CHSRA happened to have picked North Lane for a before/after comparison of a grade separation. The authority's photo simulation features a vaguely European structure elevated by approximately 10 feet, with electrification poles placed between the tracks--evidently to keep high voltage away from trees. In another photo simulation that clearly seeks to convey a different message, the pro-tunnel grassroots group Don't Railroad Us! shows the depot building overwhelmed by a fully elevated viaduct executed in the worst freeway-brutalist style, with unsightly high voltage headspans reaching high into the sky. If the tracks are elevated at North Lane, the result may not look quite as good as the CHSRA photo, but it's also a safe bet that it won't look quite as bad as the Don't Railroad Us! photo. Weekday Caltrain service to the Broadway Burlingame station, formerly ranked #23 in ridership, was discontinued in July 2005 to allow express service to be scheduled more effectively--despite objections from city officials who pointed out that a large portion of Burlingame residents lived near that station. Unfortunately, too few of them used the train. Nevertheless, Broadway is a station that could benefit greatly from electrification and HSR. Because of improved train performance, more Caltrain stops can be made in a given trip time, and stations that once fell on the wrong side of the Baby Bullet cut-0ff have an excellent chance of being revived. 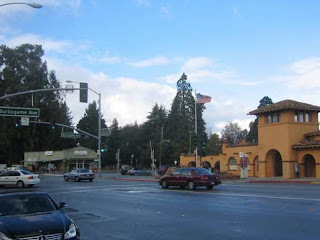 The city of Burlingame requested in its scoping comments that the Broadway grade separation project be coordinated with the nearby Broadway interchange with highway 101, where a $73 million reconstruction is planned for traffic congestion relief on what is a primary access route for the city. Burlingame is known for the majestic Eucalyptus trees that line many of its thoroughfares; the tree even appears on the seal of the city. 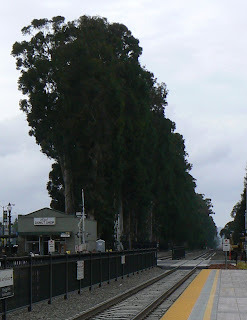 Rows of mature Blue Gums (eucalyptus globulus) line the railroad tracks through most of the city (photo by K. Hecteman). The tree has a long-standing relationship with the railroad: it was reportedly cultivated in California to quickly produce timber for railroad ties. Many of these trees could be affected by the high-speed rail project because E.globulus has a root system that can grow primarily out sideways. Furthermore, this species tends to shed long ribbons of bark, something that may be frowned upon when 25,000 volt overhead wires are strung up nearby. While detailed impacts are still to be evaluated, Caltrain did produce a Tree Survey and Assessment for its own two-track electrification project that considers Burlingame in some detail. The impact of four-track HSR construction will depend on the selected construction method. Burlingame is lucky that the right-of-way throughout most of the city is over 100 feet wide, with some stretches over 150 feet wide. The only pinch point is at the southern end of the city, where the tracks are lined by the parking lots of auto dealerships--land that would not be difficult to acquire. For details, consult Caltrain's right-of-way maps for mileposts 13, 14, 15 and 16. 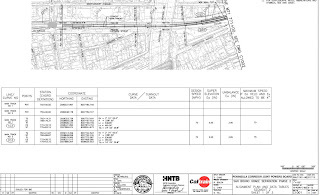 Burlingame has six grade crossings and one pedestrian grade crossing, shown in the profile diagram below (created from Caltrain track survey maps). The tracks already form an undivided barrier through half of the town, serving as a buffer between residential and industrial zones. The first thing to notice is just how low the land lies: barely 15 feet above sea level. Since all tracks must be grade-separated for HSR, the tracks must either go over or under the roads--keeping in mind that roads are difficult to raise or lower without big impacts to properties along each side. The basic vertical alignment options for Burlingame were first revealed in the CHSRA's preliminary alternatives analysis; the tracks will run at grade until just before Broadway, and continue along one of three possible alignments: above, at, or below grade. That doesn't narrow things down very much. Despite the city's stated wishes, it's probably safe to rule out a deep bored tunnel that goes far below sea level--that sort of structure is better suited to crossing bodies of water or mountain ranges, not suburban neighborhoods with 100-foot right-of-way and flat topography. That's why the next diagram shows only a 30-foot deep trench. More than one mile of this trench would dip below the water table (which lies ~10 feet below the surface in this area), and it would likely require constant pumping. The Sanchez creek would need to be "grade-separated," as would the other minor aquifers that run through a half-dozen culverts alongside and under the tracks in this area. This trench might be expensive and challenging not only to build, but also operate and maintain. Those challenges will inexorably lead back to the much-reviled elevated track solution. The diagram below shows split grade separations, with the tracks elevated by ~16 feet and the roads depressed by a low-impact ~5 feet. While the elevated solution will not impede physical access from one side of the tracks to the other, it is perceived as a community divider, especially for the one-quarter of Burlingame's population that resides east of the tracks on the other side of Burlingame High School and Washington Park. Elevated tracks promise to be highly controversial, and will have to be weighed against the far greater property impacts of sinking the roads underneath the tracks, in a sort of pick-your-poison situation. Ultimately, Burlingame will not entirely control its own fate. From a technical point of view, what happens immediately south of Peninsula Ave as the tracks enter downtown San Mateo will have (literally) far-reaching implications for Burlingame, because the tracks cannot rise or fall quickly--thereby forcing the solutions to match up on each side of the border. Because San Mateo is a far more difficult problem to solve, Burlingame will have to build a close collaboration with its larger neighbor to obtain a solution that suits both cities. NOTE: This post will be updated continuously, as warranted by additional information or new events relating to Burlingame. The acronyms ERTMS, ETCS and GSM-R refer to the European Railway Traffic Management System and its components (the European Train Control System and the GSM-Railway cell data standard). 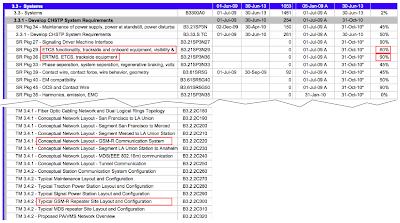 The completion levels for these documents suggest that ERTMS has already been selected as the train control technology for the California High Speed Rail System. Quite wisely, the project appears to have selected an off-the-shelf technology standard that was developed and debugged using billions of Euros of OPM (Other People's Money). The design, integration, testing, and deployment to commercial service of CBOSS is estimated to cost $231 million, before the cost overruns and schedule delays inevitably associated with this type of development effort. While some of this funding was expected to come from the $2.25 billion California HSR stimulus award, how likely is the CHSRA to fund the CBOSS project if it has already selected ERTMS for itself? Caltrain needs to wake up and stop striving for compatibility with freight PTC. The correct solution is to abandon CBOSS, join forces with the CHSRA to bring ERTMS to the United States, and implement an integrated Caltrain / HSR train control system. Navigating the bureaucratic hurdles of importing ERTMS, ETCS and GSM-R is likely to be far quicker, easier and cheaper than trying to re-invent the wheel with CBOSS. That's especially important because Caltrain's fleet replacement effort cannot proceed until after a robust train control solution is in place. The clock is ticking as Caltrain's antiquated diesel trains fall further into obsolescence, and failure is not an option. This appears to be the first nail in the CBOSS coffin.